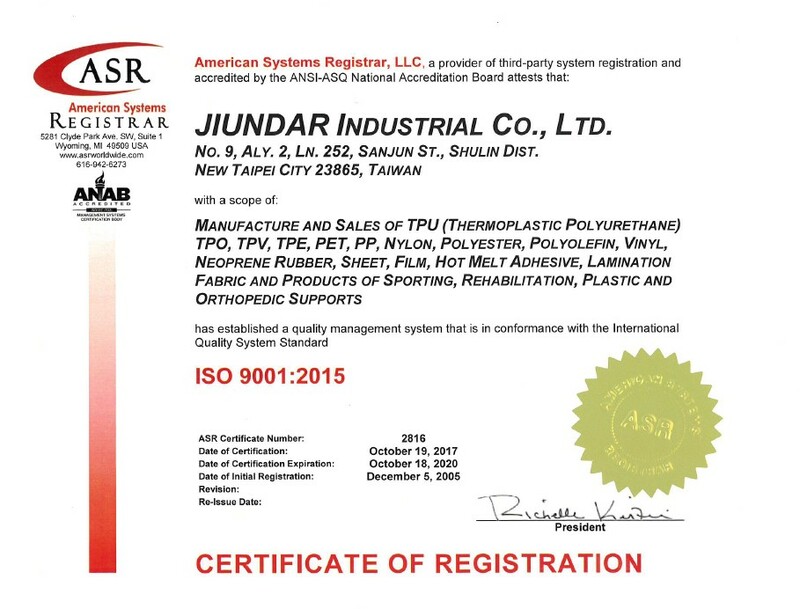 Jiundar Industrial Co. Ltd, established in 1984, has specialized in the lamination of industrial fabric used in Shoe making, Diving suits, Sports medicine and garments. In 1988, we began planning the development of TPU film and with three years of research and development started mass production in 2001. Subsequently in 2004 we added a second production line to respond to the ever increasing demand from the market. film is the TPU film we produce which has the superior physical properties of abrasion resistant, great flexuosity, excellent strength and low temperature tolerance. TPU is biodegradable, so it is the best substitute for Vinyl. TPU can be processed in many ways: Radio frequency welding, ultrasonic welding, heat press, vacuum forming, laminating, sewing and printing. series has already been used widely in all kinds of industries. We provide not only TPU films and sheets, our expertise also enables us to process the extrusion of TPU and lamination of fabric such as nylon woven or knitted (onto TPU) simultaneously. Our latest edition is TPU foam series. We invite you to try and experience this new incredible material with us. Copyright © 2013. All Rights Reserved. Best viewed on 1024 X 768 pixels.